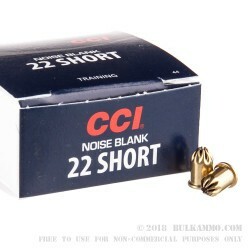 This .22 Short blank ammunition from CCI is useful for situations where the report of a gun is desired but the actual projection of a bullet is not. 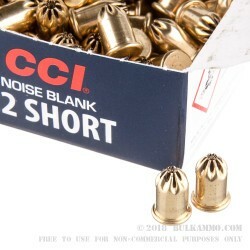 Applications for blank ammo include theatrical productions, firearm demonstrations, ceremonies, and competitive events. 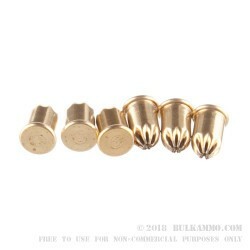 While blanks are specifically intended to be used safely in situations where live ammo would not be suitable, they can still cause serious injury at close range. 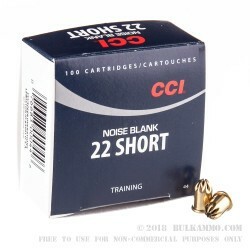 Blanks are constructed using a brass case crimped at the top with wadding to keep the powder inside the cartridge; this wadding can be ejected forcefully and strike people or property at very short distances. Firearms loaded with blanks should be handled with care. CCI (Cascade Cartridge Inc) is a division of Vista Outdoor known for producing high quality (but affordable) rimfire ammunition such as the Mini-Mag, Stinger, and Quick-Shock. Established in the 1950s, CCI is based in Lewiston, Idaho along with Speer, its sister company.